Göring. Hess. Mengele. Dönitz. Names that conjure up dark memories of Nazi Germany and the Holocaust. They were the architects of the Third Reich. And they were fathers. 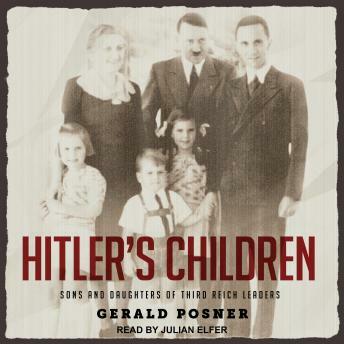 Gerald Posner convinced eleven sons and daughters of Hitler's inner circle to break their silence. Hitler's Children is much more, however, than a series of startling family interviews. It is also a spellbinding insider's look at some of the men whose names have become synonymous with terror. This is a classic book about the second generation of Nazi perpetrators (the only one ever to have family interviews with Hess, Mengele, Donitz, and Göring.) No other book author or documentarian ever got those children to talk again. And Norman Frank, the eldest son of war criminal Hans Frank, also never spoke to anyone but Posner.